Grevillea Poorinda Blondie can grow to 12 feet. 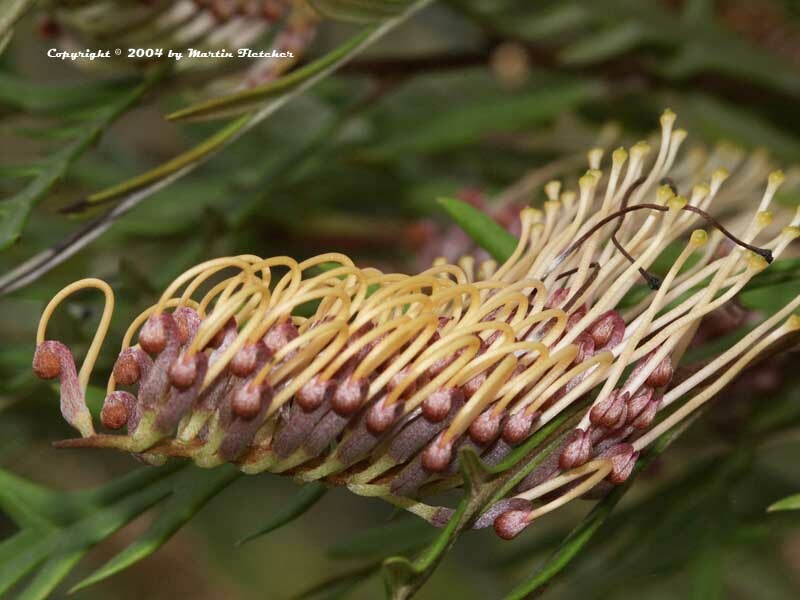 The Toothbrush Grevillea naturally has a dense branching structure and will readily form a solid screen. The Yellow Toothbrush Grevillea blooms sporadically for much of the year but has its heaviest bloom in the early spring. Greville Poorinda Blondie moderately frost tolerant and has survived temperatures in the high teens. Grevillea Poorinda Blondie is fairly tolerant of many soil conditions, so long as their roots are not stuck in a bog. Grevillea Poorinda Blondie is a great addition to the hummingbird garden. Flowers and foliage of Grevillea Poorinda Blondie - Yellow Toothbrush Grevillea. High resolution photos are part of our garden image collection.